Planning a gala? These events are a staple for fundraising and corporate celebrations. But if you think your next gala needs to include only a few white stage lights, a projector, white tablecloths, a plated dinner, and guests seated at the same table all night, think again. Toss those traditional assumptions aside and make way for something fresh, energizing, and definitely memorable. Here are six ways to plan a non-traditional gala. Sure, you could host another gala at a hotel, but chances are your guests have attended countless events held at hotels in the area and your event venue will seem no different. Instead, scout out one-of-a-kind spaces like museums, art galleries, or a historical building. Spaces with an architectural character or educational and beautiful artwork will add intrigue to your event. If you can't land that cool space you were hoping for, don't worry, there are several ways to enhance the look of any event venue. Projection mapping, for example, is a great way to transform a space into something entirely different. Use walls, ceilings, even floors to project images or video and alter the look of your space while drawing attention and awe from your guests. 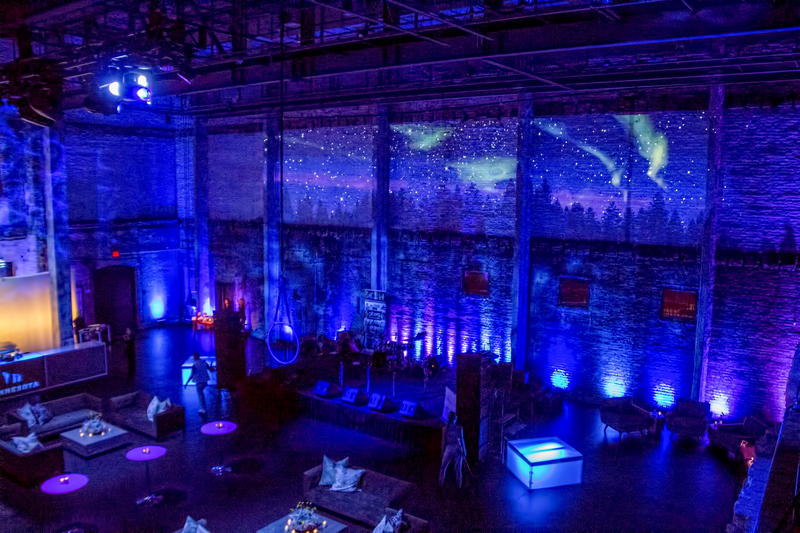 Our Heroic Productions staff once projected a moving graphic of the northern lights on a tall brick wall using two projectors for the event. The colors changed and flowed above a forest silhouette below. In another instance, we projected a textured pattern on the floor to mimic the ground outdoors. Since you can project images onto almost any surface, you can also create virtual centerpieces on your dining tables. Or, if you’re planning a gala that includes a big sheet cake, map onto that in lieu of the usually frosted decoration. Deliciously eye-catching! Need a more budget-friendly decorating strategy? No problem. You can do a lot to a room with a plain white backdrop and some colorful lights. Use light to define spaces or change spaces throughout the event. For example, we lit a room one color as guests arrived, but changed colors after each session to make it feel like attendees were in a new space. You can also use colorful lights to highlight the silent auction tables, live auction display, and dinner tables. Speaking of light, LEDs can also be used to wow attendees. Create a wall of LEDs as guests enter, or create a podium, display table, or presentation cube out of LEDs. This is an easy way to spruce up a small part of your event. Another option is to use ribbon LED screens (much like the ribbon LED screens that wrap around the stands in a stadium). These screens can be used to frame your entrance or highlight the registration table. We know it seems smart to provide every guest with a specific seat for the evening, but round tables for 8 or 10 make it difficult to chat with anyone outside your table. Instead, sprinkle food and beverage stations around your space so guests can mingle and munch at the same time. Do include some bistro tables, and for seating, create comfy lounge-type arrangements. Your guests will love the less formal, friendly environment. Presentations are a given at any gala, but guests want an entertaining evening out. Find fun performers that will take your event to the next level. One of our clients brought in some talented acrobats who performed from cloth hanging from the ceiling. Don't have room for that type of entertainment? Jugglers, comedians, and magicians are a great choice, too. How about a caricature artist armed with an iPad to produce digital sketches guests can post or Tweet? Go immersive for the program part of your gala. Map your story onto the walls or ceiling (complete with audio), or incorporate activation stations where guests can “get the point” of your gala via short quizzes, VR headsets, videos, or other hands-on activities. Projection mapping and other trendy AV options aren’t cheap, especially for nonprofits trying to raise money. So, scout for sponsors. Sponsorships are a great way to attract more attendees and raise more money. And what forward-thinking brand wouldn’t love to get behind your pioneering event? We could go on, but you get the idea. Planning a gala does not have to be more of the same. Whether you want to step outside the box or take your guests over the moon, your AV partner can help bring your vision to reality.